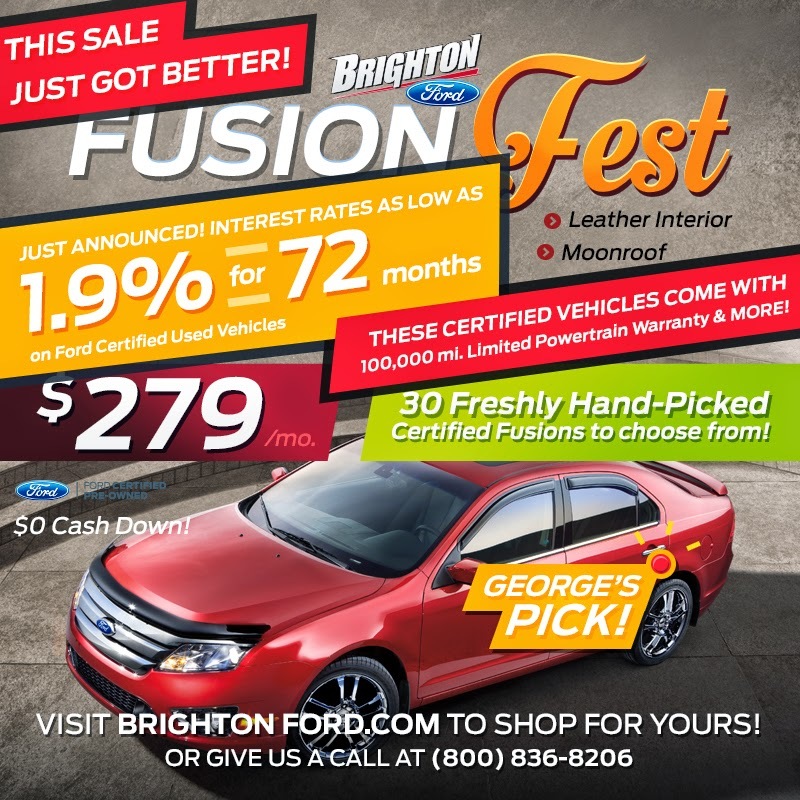 Brighton Ford : The NEW Fusion Fest at Brighton Ford! BRIGHTON, Mich - Ford Motor Credit is LOWERING interest rates to 1.9% for 72 months on Ford certified used cars, which means the NEW Fusion Fest at Brighton Ford just got EVEN BETTER! Choose from an awesome selection of 30 hand-picked, certified, Ford Fusions from the Brighton Ford Fusion Fest Inventory. The best part? They are all just $279 a month! The NEW Fusion Fest at Brighton Ford is offering customers 1.9% for 72 months on these certified vehicles that come with a 172-point inspection, a Ford 100,000 mile limited powertrain warranty, vehicle history report, a full tank of gas and MORE! Believe us, you'll want to hurry in - these beauties won't last long! Questions? Feel free to stop by the dealership or give us a call at (800) 836-8206! We are located at 8240 Grand River Ave. just north of I-96 in Brighton. We are a family owned and operated business that strives for customer satisfaction. For more information on Brighton Ford visit BrightonFord.com.